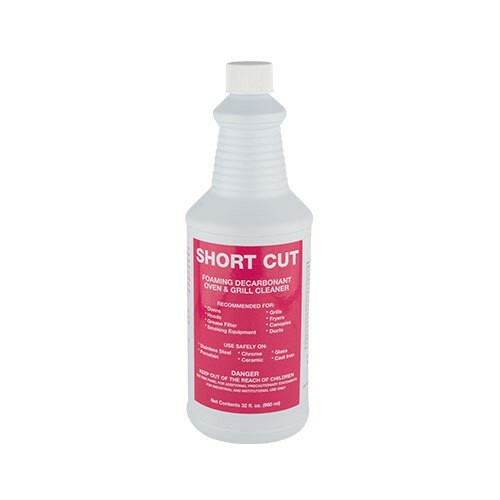 SHORT CUT | Pro Chem, Inc.
SHORT CUT is an effective, rapid remover of baked on fats, greases, proteins and carbohydrate residue of animal and vegetable origins. Its unique formula allows the foam to cling to vertical surfaces for virtually unlimited contact time without dripping. This allows it to penetrate and loosen burnt-on soils so they can be wiped off and rinsed clean. In addition, it is economical, nonflammable, easy to use and does not emit any toxic fumes. Apply SHORT CUT to warm or cold soiled surfaces. Allow to contact and soak for up to 15 minutes until product has had ample time to penetrate stubborn soils. Wipe off and rinse clean. For heavy buildup, an additional application may be required.